The year 1976 was in the middle of a decade characterized by social, economic, political, and cultural upheavals. Growing affluence freed leisure time for sports, travel to faraway places, cultural interests, and intellectual discourse. People worked to live rather than living to work. Philippe Stern was a typical representative of this generation. 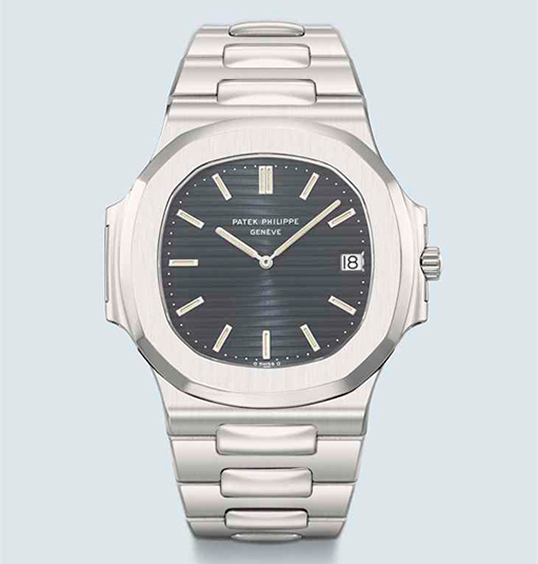 In 1932, his grandfather Charles, along with brother Jean, acquired Patek Philippe, a respected watchmaking company. In 1976, Henri Stern was president of the family-run enterprise, and his son Philippe, who already held an executive position, was poised to succeed him. It was the right time for a showpiece, so he decided to launch a sports wristwatch for the first time in the 137-year history of the manufacture. In close collaboration with Gérald Genta, one of the most gifted watch designers of the 20th century, an innovative timepiece began to take shape: the Nautilus Ref. 3700/1A. The salient features of the Nautilus Ref. 3700/1A were two lateral case extension ridges at 9 and 3 o’clock, resembling hinges that joined the two-part case ensemble (conventional cases consist of three parts). They were inspired by the locking mechanisms of classic ocean liner portholes that could be sealed to prevent the ingress of water. The crystal was framed by an octagonal bezel with gently curved sides and rounded corners, satin-finished on the upper plane and mirror-polished on the beveled flanks. The solid stainless steel bracelet featured the same matt/gloss effect. The dial, in a blue-tint charcoal, stood out with a horizontal embossed pattern and was graced with applied luminous baton hour markers to match the slender luminous baton hands. To mark this anniversary, Christie’s presented Patek Philippe Nautilus 40, a 40 Lot Sale broken up across 4 different auctions held in 4 different cities, and each sale presenting 10 Nautilus models. The Nautilus Ref. 5976/1G, a seriously oversized flyback chronograph dressed in white gold livery, exhibiting a 44 mm diameter – 49.25 mm oblong sides included. The dial displays the commemorative embossing just under the logo at 12 o’clock, a prominent monocounter located at 6 o’clock and Top Wesselton baguette and is preciously enhanced with princess-cut diamonds totaling 0.29 carats. It comes in a limited edition of 1300 numbered pieces. The Nautilus Ref. 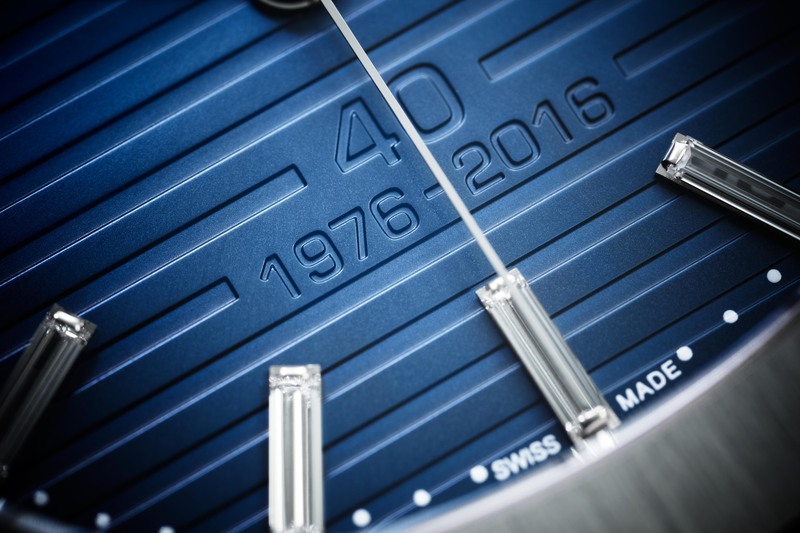 5711/1P just tells the time and the date but is carved out in solid platinum and comes in a much more limited edition of 700 pieces. 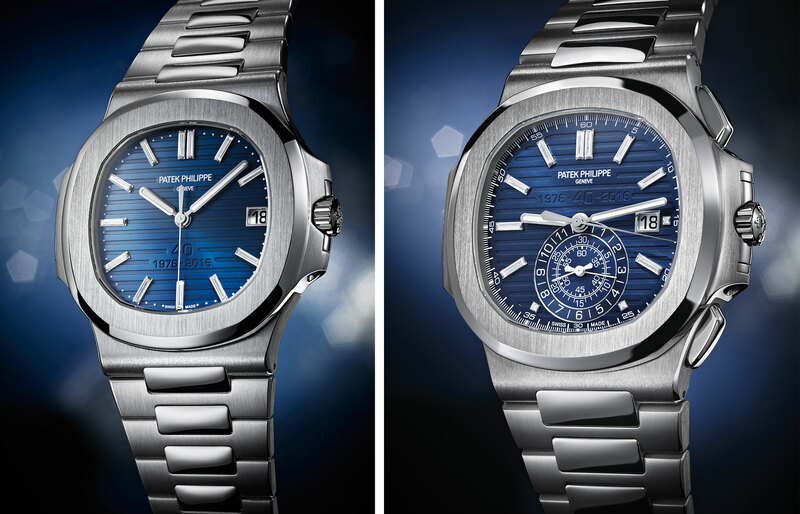 The blue sunburst dial features the typical horizontal Nautilus signature embossing and a two-line anniversary citation “40” and “1976–2016″ positioned at 6 o’clock. The 12 hour indexes are all baguette-cut diamonds totaling nearly 0.34 carats, which create a sparkling contrast against the dark blue background. 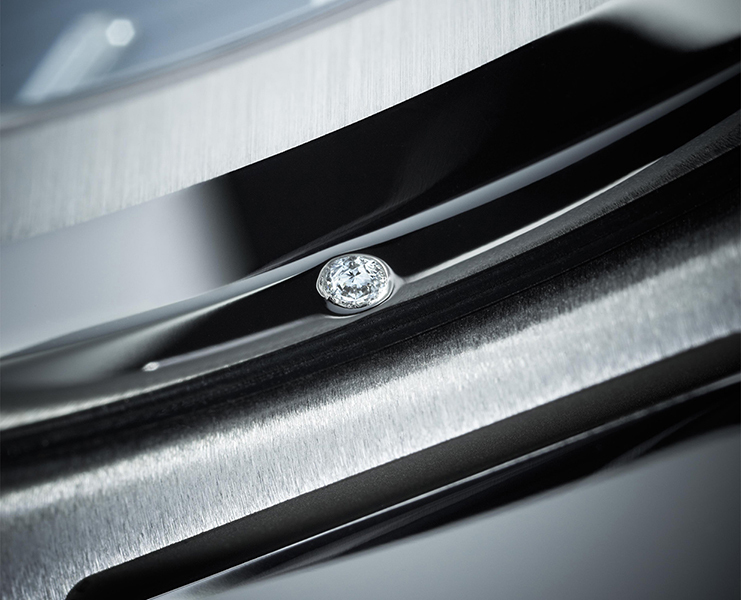 The solid platinum 950 case not only ranks among the most precious of noble metals but is also very challenging to machine. Its tough, ductile consistency abrades drill bits, milling heads, files, and polishing tools much more severely than gold or steel, distinctly intensifying the effort invested in working the three-part case and the link bracelet of the Nautilus with many forms of finissage, such as chamfering, satin-finishing, sandblasting, and mirror polishing. 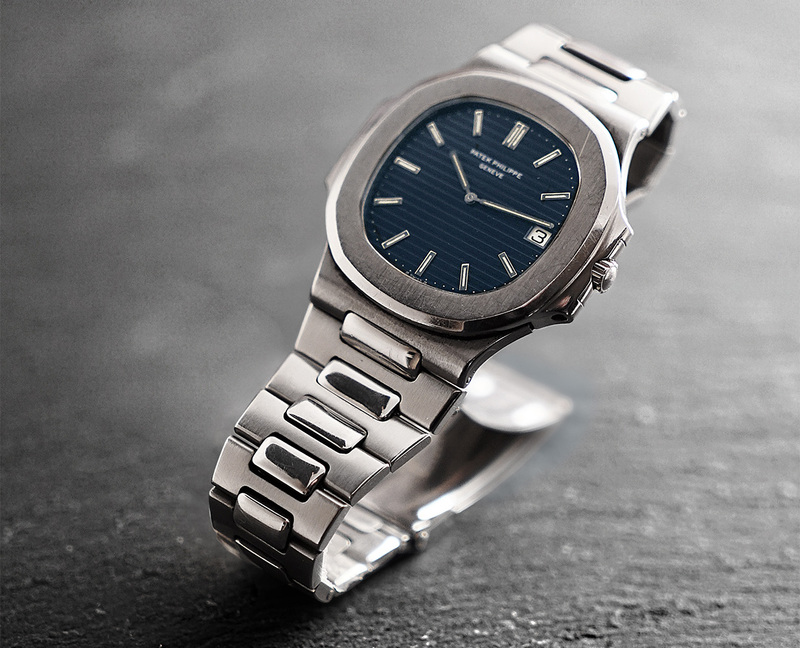 As all other Patek Philippe watches crafted in platinum, the new Nautilus Reference 5711/1P is fitted with a flawless rare white Top Wesselton diamond – approximately 0.02 carats – in the bezel above the lugs at 6 o’clock. Both timepieces are presented in a vintage-style anniversary box made of brown natural cork – an authentic replica of the stylish 1976 original. Like the original Nautilus, it evokes vivid associations with the proud ocean liners that inspired the porthole design of the casually elegant timepiece. 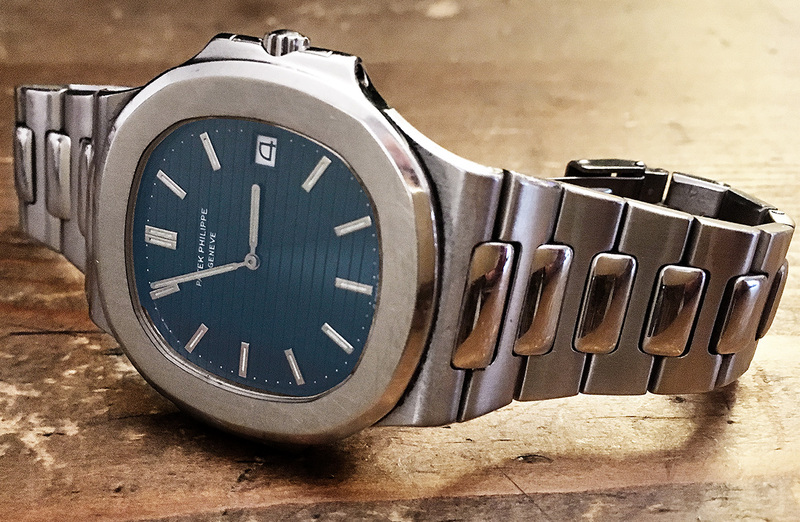 The steel plaque on the front side, also a faithful replica of the 1976 original, displays the name “Nautilus” and the PATEK PHILIPPE GENEVA signature logo. 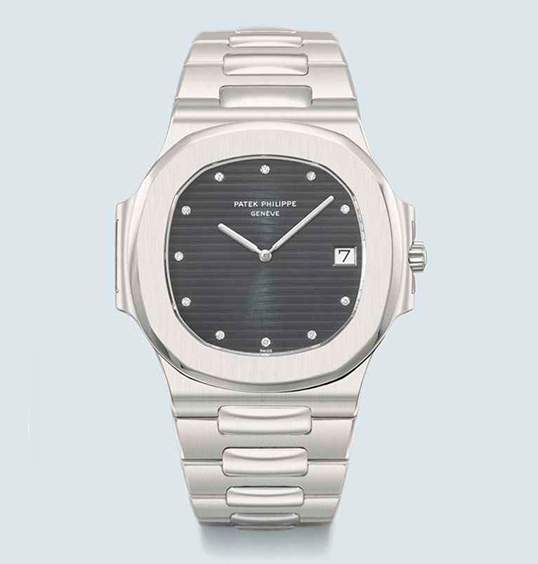 For more, visit the Patek Philippe website. Reportedly, the Nautilus line could somehow evolve in new and unexpected ways, perhaps unveiling other 2 commemorative versions, one of which might exhibit a perpetual calendar. Definitely, an unprecedented event.